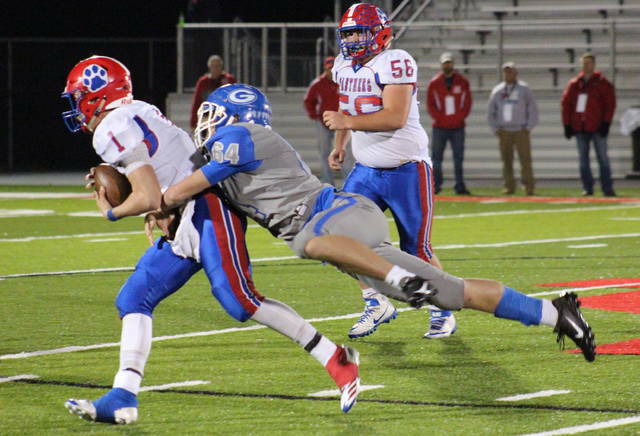 Gallia Academy sophomore Coen Duncan (61) breaks through the Licking Valley line and pressures quarterback Chase Whisner (1), during the Blue Devils 36-12 setback on Saturday in Jackson, Ohio. Gallia Academy junior Cade Roberts (34) runs after a catch, during the first half of the Blue Devils’ postseason game on Saturday in Jackson, Ohio. JACKSON, Ohio — It wasn’t quite the ending the Blue Devils had hoped for, but the experience will never be forgotten. In its first playoff game in six years, second-seeded Gallia Academy trailed by three points at halftime, but seventh-seeded Licking Valley scored 21 unanswered points after the break to take a 36-12 victory in the Division IV, Region 15 quarterfinal on Saturday at Jackson High School’s Alumni Stadium. 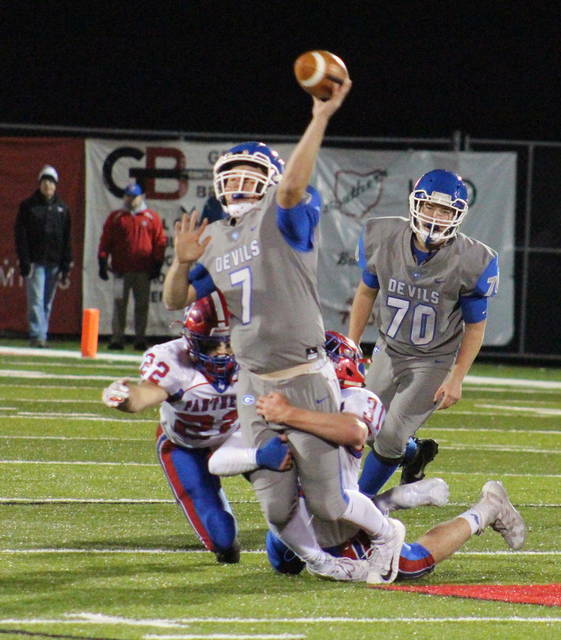 Gallia Academy (9-2) — champions of the Ohio Valley Conference, making the program’s 11th playoff appearence — picked up a pair of first downs on the game’s opening drive, but a pair of penalties followed by a sack halted the Blue Devils and forced a punt. 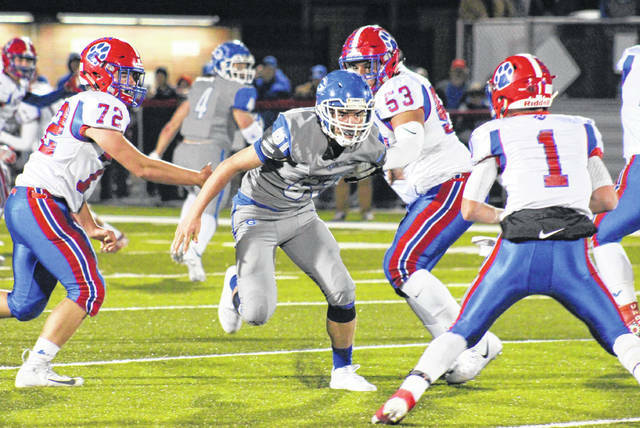 Licking Valley (8-3) — making its second straight playoff appearence and 18th overall — broke the scoreless tie on its first drive, covering 76 yards in 10 plays, with quarterback Chase Whisner scoring on a five-yard run. Connor McLaughlin ran in the two-point conversion to make the Panther lead 8-0 with 5:47 left in the first. The Blue Devils responded with an 11-play, 63-yard drive, which senior Jacob Campbell capped off with a one-yard touchdown run. The GAHS two-point conversion pass failed, leaving the hosts with a 8-6 deficit. The Panthers’ next drive took the game into the second quarter and LVHS found paydirt with 10:14 left in the half, as Whisner finished an 11-play, 66-yard drive with an eight-yard run. Joshua Rhymer hit his first four four straight extra point kicks, making the LVHS lead 15-6. After a punt by each side — Licking Valley’s only one of the game — the Blue Devil offense took over at its own 13. On the third play of the possession, Campbell broke a 74-yard touchdown run with a lead-block from senior quarterback Justin McClelland. Gallia Academy’s extra-point kick was blocked and the Blue and White trailed 15-12 with 3:01 left in the half. Licking Valley made it as far as the GAHS six-yard line on the ensuing drive, where an inadvertent whistle erased a Blue Devil fumble recovery. Two plays later, Campbell intercepted a Panther pass, but the clock expired before the GAHS offense could take the field. Out of the half, Licking Valley marched 63 yards in 13 plays and 6:47, with McLaughlin scoring on a 10-yard run to give the guests a 22-12 advantage. GAHS made it to the Panther side of the field before losing possession on downs at the 44. LVHS needed eight plays to cover the distance, and increased its lead to 29-12 with 10:56 left in the game, as McLaughlin caught a six-yard touchdown from Whisner. 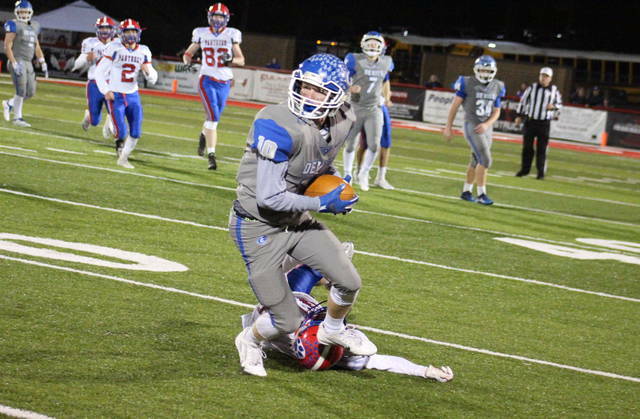 Gallia Academy’s ensuing drive featured a pair of four down conversions, and reached the LVHS 13, before junior Noah Hopkins intercepted a pass to restore possession for the Panthers. Licking Valley made the most of the turnover, with McLaughlin breaking a 62-yard touchdown run with 6:36 left. GAHS fumbled the ball away in LVHS territory on its final offensive possession, with Hayden Hile recovering for the guests. Licking Valley ran out the clock with six consecutive carries and a kneel down, sealing the 36-12 victory. Following the first setback since Week 3, GAHS head coach Alex Penrod acknowledged that this wasn’t just another season, but something that brought the community together. The 36 points allowed by GAHS was the most of the season, and this Blue Devils squad finishes as highest scoring team in program history. 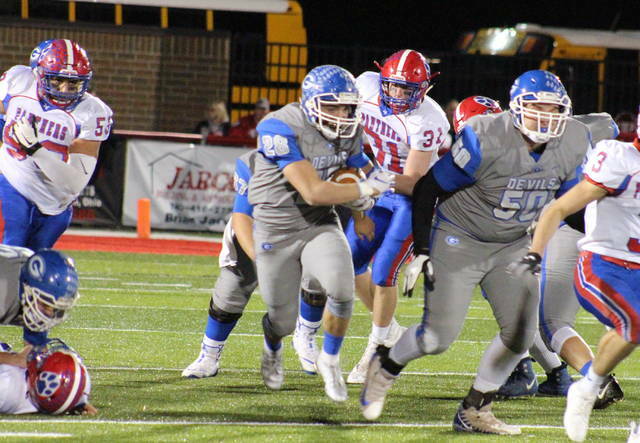 For the game, Penrod noted that Licking Valley’s power run game after halftime, as well as the Blue Devils’ missed opportunities, gave the Panthers the ultimate edge. For the game, the Panthers claimed a 25-to-14 advantage in first downs. Licking Valley was 10-of-14 on third down conversions, including 8-of-9 in the second half. LVHS converted all-3 of its fourth down tries, including one in the second half. GAHS was 3-of-7 on third down and 2-of-5 on fourth down in the game. The Panthers earned a 520-to-277 advantage in total offense, including 386-to-170 on the ground. GAHS earned 150 of its 170 rushing yards before the half, with LVHS earning 259 rushing yards in the second half. Both teams had a pass intercepted, with the Blue Devils also losing a fumble. GAHS punted twice in the game and was penalized seven times for 23 yards, while LVHS picked up six flags for 55 yards. The Panther defense claimed all-5 of the game’s sacks, totalling 21 yards. 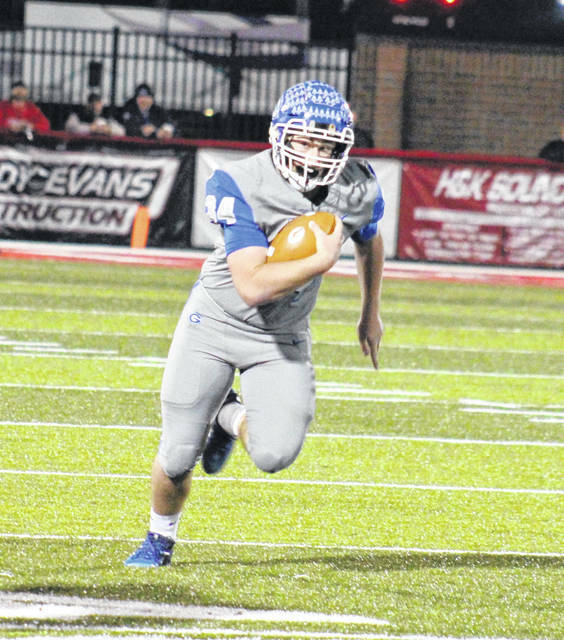 Jacob Campbell led Gallia Academy’s offense with 113 yards and two touchdowns, combining nine carries for 105 yards in the first half with one catch for eight yards in the second. McClelland was 13-of-18 passing for 107 yards with an interception, while gaining a net of two yards on 11 carries. James Armstrong had 60 total yards five receptions for 44 yards and a pair of carries for 16 yards, while Lane Pullins finished with 47 yards on eight totes. Cory Call hauled in five passes for 37 yards, while Cade Roberts and Michael Beasy each caught a nine-yard pass. McLaughlin posted 267 total yards and a trio of touchdowns to lead the victors, earning 250 yards on 24 carries and 17 yards on a pair of receptions. Of McLaughlin’s game-best 250 rushing yards, 214 came in the second half. Whisner was 12-of-18 passing for 134 yards and and a touchdown, while rushing 19 times for 104 yards and two scores. Carson Conley led the LVHS receiving unit with six receptions for 65 yards, while Will Schneider had a game-best two sacks to lead the Panther defense. This marks the final game in the prep careers of GAHS seniors Jacob Campbell, Justin McClelland, Cory Call, Trentin Waller, Lane Pullins, Cole Davis, Carter Campbell, Colton Russell, Logan Rose and Christian Mayse. Penrod talked about the perseverance of the seniors, who lost 20 of their first 23 varsity contests, but won 13 of their final 18. Penrod also noted that the underclassmen have been shown the way to return to the postseason. Licking Valley advances to the Region 15 semifinal against third-seeded Indian Valley on Saturday at a location to be determined.